Admit it, 99% of your Twitter searches are for vanity purposes. You do it, I do it, we all do it. And such a search revealed a potentially very useful and powerful new feature today. 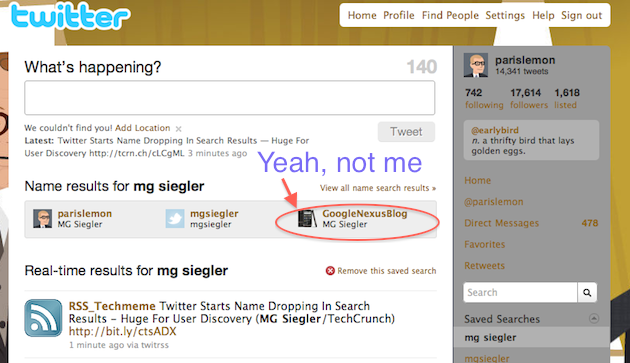 Twitter is now injecting name results into searches on twitter.com when you do a regular search for a name. To be clear, Twitter has had a name search option for some time, but this is the first time they’ve put it front and center in the main tweet stream when you do a search. As you can see, name results now appear just above regular realtime tweet results for name searches. These names are displayed horizontally rather than vertically (as regular tweets are). This feature adds another user discovery layer to Twitter. And this is potentially the biggest one yet. 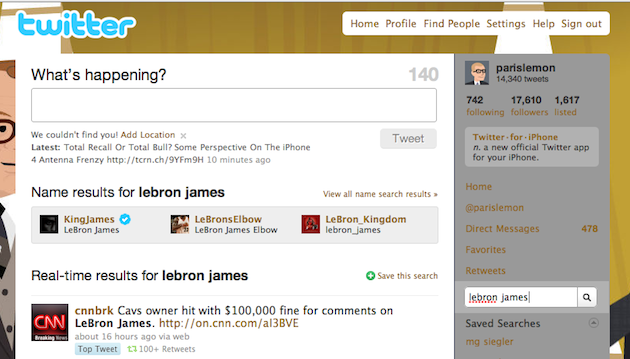 For example, when I search for “LeBron James” now I can see his actual account on top of the results and follow it with one click (thanks to the hovercard). That’s very powerful. Twitter recently updated its docs to reflex this new people discovery feature. A year ago, they tweaked their title tags to help with user discovery for SEO. The feature also uncovers a number of false or fake accounts — so verified accounts are likely to be more important than ever. Twitter smartly added the little blue checkbox next to name in these results to show the verified one (and presumably puts those ones first). Expect celebrities on Twitter to get a lot more followers with with new feature.